d.not to obtain or attempt to obtain unauthorised access, via whatever means, to any of SingHealth’s systems. 2.1 You may not reproduce, republish, upload, post, transmit, distribute or link in any way any material from this Website without the prior written permission of SingHealth. 2.2 If you download any software from the Website, including any files, images incorporate in or generated by the software, and data accompanying the software (collectively, the “Software”) are licensed to you by SingHealth. SingHealth does not transfer title to the Software to you. You own the medium on which the Software is recorded, but SingHealth retains full and complete title to the Software and all intellectual property rights therein. You may not redistribute, sell, transfer, decompile, reverse-engineer or otherwise deal with the Software. 4.2 The materials on this Website are provided “as-is” and without warranties of any kind either express or implied. To the fullest extent permissible and subject and pursuant to applicable law, SingHealth disclaims all warranties, express or implied, including, but not limited to, implied warranties of satisfactory quality, merchantability and fitness for a particular purpose. SingHealth does not warrant that the functions contained in the materials will be uninterrupted or error-free, that defects will be corrected or that this Web Site or this server that makes it available is free of any virus or other harmful elements. 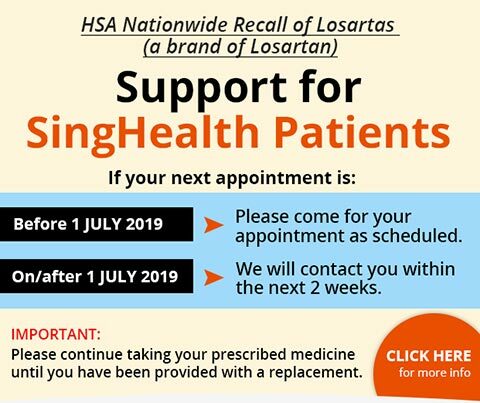 SingHealth does not warrant or make any representations regarding the correctness, accuracy, reliability, or otherwise of the materials on this Website or the results of their use. 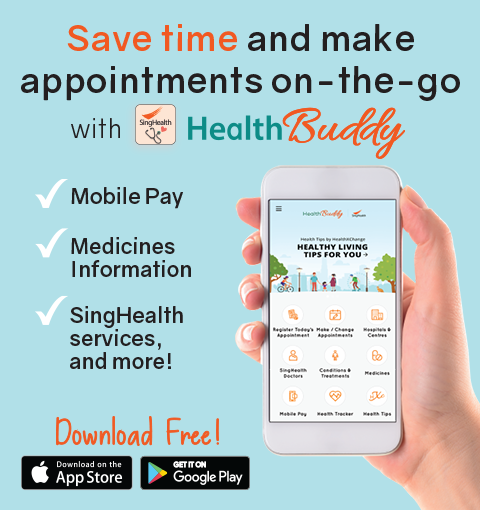 9.1 This Website contains links to other websites which are not maintained or owned by SingHealth. Similarly, the other websites may contain links to this web. 10.1 SingHealth may change any part of this Website at any time at its sole discretion without notice. SingHealth may deny access to this Web Site to anyone at anytime.